The global entertainment juggernaut, Cirque du Soleil is back with a brand new show. For the last few years, the one of its kind circus has been trying to set up a long running show in New York, but the biggest market in theater has been dismissing all of its efforts. 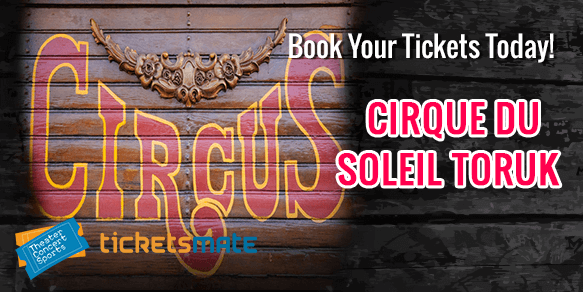 Finally Cirque du Soleil has returned with a spectacle that offers the audience the best-of-both-worlds – a stunning stage production and a captivating story. “TORUK — The First Flight” is inspired from the record breaking film Avatar and is written and directed by Michel Lemieux and Victor Pilon. Packed with stunning visuals and choreography, the production has hit the road on a nationwide tour. Audience with Cirque du Soleil Toruk tickets will be treated to cutting-edge stagecraft and puppetry. Tickets for Cirque Du Soleil Toruk are currently unavailable. Cirque du Soleil has often weaved stories of the mythical nature into spectacular circus performances. The Canadian entertainment company is also known to have infused elements of popular culture into its concepts as seen in the hit shows “Criss Angel Believe”, “Viva Elvis”, “Michael Jackson: The Immortal World Tour” and “Michael Jackson: One”. All of Cirque du Soleil’s productions are driven by amazing special effects, stunning acrobatics and the performers showcasing incredible agility, balance and strength. While most of the productions by Cirque have incorporated narrative elements, they had mostly been there to link together the circus acts. TORUK – The First Flight is the only show by Cirque du Soleil to be actually based on a story and is inspired by James Cameron’s epic movie, Avatar. Based in the lush world Pandora from Avatar, the live show takes the audience almost 3000 years back from the time showcased in the movie. The script has been flipped a bit to match the plot and in a typical Cirque du Soleil style, circus arts has been weaved into the cohesive story. The critics feel that the company has reinvented itself with this latest production, treating the audience to a visual feast and an engrossing story. Buying Cirque du Soleil Toruk tickets will be totally worth it as the company has finally created a Broadway masterpiece and given it a Cirque makeover. TORUK is written by the co-directors Michel Lemieux and Victor Pilon, along with the playwright Olivier Kemeid. The fable-like tale starts with the two youngsters Ralu and Entu who embark on a journey to save their civilization Na’vi – a race of blue-skinned humanoids. Both have their own set of skills which lay the foundation for mind-blowing tumbling and gymnastics, as well as aerial stunts. The stunning visuals include floral imagery that highlights the duo’s botanical skills, the huge volcanic eruption and multimedia spectacle. Around 40 video projectors are placed throughout the stage that create a new ambiance for each scene and help in keeping things real. Various creative aerial acts are blended into the story along with a bit of puppetry and the soaring kites’ scene. Projected scenery and the clever use of lights and other effects transport the audience into the world of Pandora. TORUK – The First Flight is for the entire family and the kids will especially enjoy it as the show doesn’t feature any weird or creepy characters. The adventure story will keep you hooked throughout and you’ll leave the arena thoroughly entertained. Cirque du Soleil Toruk is based on James Cameron’s movie, Avatar. The Avatar universe will come to life on different stages in 2017. This is your chance to get Cirque du Soleil Toruk tickets and enjoy it live. It is created, written and directed by Michel Lemieux and Victor Pilon who have given Cameron’s movie a new spin. TORUK – The First Flight captivates the audience with its mythical tale and stunning visuals. In the US, it opens on March 3 2017 in Cleveland, OH, with several more dates for the month. The average price for Cirque Du Soleil Toruk Tickets start from $117. The minimum get in price is $43 for Cirque Du Soleil Toruk Tickets at the Pepsi Center - Denver, Denver. For a detailed look at ticket prices and amazing discounts, visit our website. Q:How long is the Cirque du soleil toruk show? A:Based on the blockbuster Avatar, the show Toruk takes the audience back to Pandora. The running time of the show is 90 minutes but there is a 15-20 minute interval in between. So keep a two-hour duration in mind when you come to attend the show. To get Cirque Du Soleil Toruk Tickets, simply visit the event's page on our website and purchase tickets by following a few simple steps. Q:What are Cirque Du Soleil Toruk dates for the tour? A:Cirque Du Soleil's latest production, Toruk has received rave reviews from critics and audiences across the country. Toruk will come to Hartford on March 16th, before moving to Dayton on March 22nd. The show will then open Taipei, Taiwan on July 6th. To catch the mesmerizing production live, get Cirque Du Soleil Toruk Tickets offered by our brokers today. Q:Are you offering any special Cirque Du Soleil Toruk deals? A:Toruk is Cirque Du Soleil's latest production and in typical Cirque fashion, the show amalgamates elements of circus and theater in a mesmerizing fashion. We are not offering any special deals for Cirque Du Soleil Toruk Tickets as yet, but we offer tickets for very economical prices. Visit the event page on our website and browse through the list of available tickets; you will surely find something which suits your budget requirements. Q:How can I pay for my Cirque Du Soleil Toruk Tickets? A:Cirque Du Soleil's Toruk is an adaptation of the James Cameron's box office hit, Avatar. The production will take the audience back to Pandora for a whole new story and will introduce new characters as well. The show has been receiving rave reviews and is a must watch for theater fans. To pay for Cirque Du Soleil Toruk Tickets you can use any valid visa, debit or master card. We accept cards by all major banks. However, tickets cannot be purchased via cash. To view available tickets, simply visit the event's page on this website. Q:Do you offer toruk tickets on discount? A:Based on James Cameron's blockbuster hit, Avatar, Toruk takes the audience to the mythical land of Pandora once again. The Cirque production revolves around Toruk, who is the central character of the musical. We offer Cirque Du Soleil Toruk Tickets in a range of prices; giving you the chance to select the tickets which best suit your budget constraints. We also offer limited discount tickets and they can be availed by plugging in the relevant discount codes during purchase. These tickets are relatively few in number so hurry up and purchase them now. Q:Who are the performers in the cirque du soleil toruk cast? A:Cirque Du Soleil's latest production, Toruk, is taking the nation by storm. Based on the 2009 box office behemoth, Avatar, Toruk brings to life the mythical land and creatures of Pandora. The performers in the circus production are skilled acrobats and gymnasts, who give the characters a whole new dimension. The cast includes Gabriel Christo, Jeremiah Hughes, Daniel Crisp, Guillaume Paquin Giulia Piolanti and Zoé Sabattié among a host of other names. To watch the production live, get Cirque Du Soleil Toruk Tickets today. Q:When can I buy cirque du soleil toruk theater tickets? A:You can buy Cirque Du Soleil Toruk Tickets from our website whenever you want. All you need to do is go to the relevant event page and check the information given about the event and ticket availability. If tickets are available you can proceed with the ticket buying process there and then. Q:How will you deliver my toruk cirque du soleil tickets? A:We will first process your order once you have completed the transaction process with our trusted brokers. Your package will then be dispatched and you will have your Cirque Du Soleil Toruk Tickets delivered by FedEx within five business days. Q:Where is the best place to buy tickets for Cirque du Soleil - Toruk 2018? A:You can buy Cirque Du Soleil Toruk Tickets from our website via our brokers. Our brokers offer some of the best prices on the internet and our service is extremely reliable. Rest assured that your tickets will reach you well with in time for the event.